The dictionary defines procrastinating as “postponing doing something, especially as a regular practice.” Procrastinating is a habit, nothing more. To stop procrastinating, you must replace the habit of putting things off with the healthy habit of getting things done. The first step is to understand WHY you are procrastinating. Perhaps the job ahead of you is overwhelming. If this is the case, don’t try to do the entire project all at once. Instead break it down into smaller tasks and tackle them one at a time. Getting even part of the job done can be a real psychological boost. Sometimes it can be helpful to set a time limit, for example thirty minutes or an hour, during which time you give whatever you’re doing your entire concentration with no interruption. When the time period is over, stop… and don’t think about this project again until the next day, when you will set aside another block of time. Continue to do this until the job is finished. Even the most daunting project can be managed easily this way and each day you will have the satisfaction of knowing that you are making progress and are that much closer to the end. If it helps to keep you motivated, reward yourself when you finish each time allotment. Perhaps you find prioritizing difficult. If you’re this kind of proscrastinator, you probably find it hard to finish a project. You keep switching from task to task and starting new ones because you can’t make a distinction between those things that should be done right away and those that can wait. Making a list with each task listed in order of importance can be a big help. Perhaps the job is unpleasant. If you can, break it down into steps and spend only a few minutes a day on each step. However, sometimes it is better to just make yourself jump in there and get something unpleasant done right away. It even helps if you tackle the most unpleasant jobs first, because once you have them off your list, everything else HAS to be better! Perhaps you are putting off making a decision or not doing something because the end result will change your life. If you’re staying in a job you hate or postponing a move, for example, because you’re afraid you may make bad decisions, the indecision itself may be causing you stress. It is easy to overthink a situation… gather all the facts you can, set a deadline for making a decision, and then force yourself to meet that deadline. Perhaps you are angry because you feel you are being forced into doing something, and your anger and resentment are making you procrastinate… but that only makes things worse. Any time you aren’t in control, it is always better for you to acknowledge your feelings and then do what you have to do as soon as you can to get whatever it is out of the way. Perhaps you have unrealistic expectations of how long something will take. Often people wait until the last minute to do something because they are sure they can get it done quickly and then discover that they are out of time and the job has not been completed. A perfectionist often unconsciously sets himself up for failure this way. Better time management will help here. If you consistently find yourself running out of time before you run out of project, get in the habit of deliberately overestimating how much time you think you will need. Perhaps you procrastinate because of distractions. If you’re trying to work with the television on or with people constantly interrupting you so you aren’t able to concentrate, a change of work habits will help. Work on an uncluttered desk or in a quiet room, and make yourself concentrate on one task at a time. If you find you are still occasionally putting things off, don’t be hard on yourself. Everyone procrastinates to some extent. And remember… replacing any bad habit takes time! You have no idea how much I needed this post at the moment. I’m the world’s worst procrastinator and it causes me so much stress that was not needed. It is certainly going to be one on my big goals next year to break this terrible habit. Great post that really hit the spot with me. I have a habit of putting off the unpleasant things and then they pile up on me. Your post gave me some fresh resolve to make things better in that area. Great blog too! I’m always looking forward to your next post. Well-written and to the point. Procrastinators think they’re making their lives easier by avoiding the difficult job, but they’re really complicating everything for everyone around them. 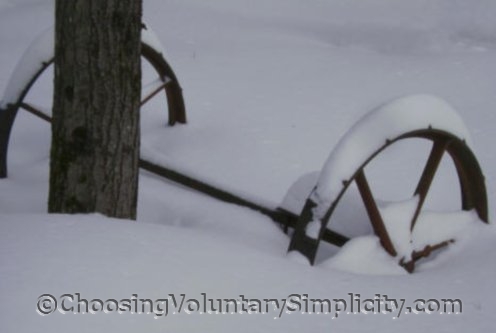 This is an excellent topic for a site about voluntary simplicity. What could be simpler than doing what needs to be done *when* it needs to be done, before it can get out of control? Anyway, thanks, another good post. Very good points! I think they are all fitting of me…for me the big one is the perfectionism, if I can’t do it right I just won’t do it at all! It’s irrational I know, but it’s part of the cycle. Because I get overwhelmed and know I can’t do it ALL or do it all as well as I want it done, so I just put it off and off and off….it’s just a vicious cycle (procrastination) I’m trying to get past it but man is it ever harder than it sounds. Always feel angry about doing stuff I feel i dont need to, but think i am getting over it with the help of this post. I’ve found that the reason for my procrastination is that there are just too many things that need to be done. If I get one thing off my list, another ten have already replaced it. Or then someone usually gives me something more to do or asks for something else, this is especially true for my children and work colleagues/bosses. By procrastinating, I at least get a little time for myself. I found that my procrastination came from fear of doing something wrong, which came from fear of conflict, which came from childhood experiences of emotional sensitivity and vulnerability with low self-esteem which came from too few “strokes” from my parents, physically and verbally. I was able to alleviate this by doing The Work (Byron Katie) [costs nothing] on the underlying beliefs and deliberately projecting my younger selves and reassuring them. The churning fear in my sternum(? bottom of ribs) faded away. Now I open letters, make complaints, draw lines, pay bills, tell people off if it feels right, get few reminder letters, do my taxes as soon as possible, ask for what I want, and post my opinions. Thanks so much for this! Right now I’m procrastinating clearing my room so my stepdad can get to the attic to work on the skylights. All the stuff that was in my closet in now out in my room because the attic access is in the closet ceiling. It’s making my room easier to clutter. I’m also staying in a job that I hate, and am having trouble turning in my notice, even though it’s not even paying enough for it to be worth my time in driving over there, I don’t like the people I work with, and have another, much better paying, great job that I love already. I’ve given myself until July to sort it out, because then I’ll have been there a year, and I only have to wait a month.